We are self-funded, citizen researchers who work with materials and documents found in the public domain. Thank you for visiting our site and reading our work. We look forward to bringing you more. In the end, we accepted our frustration. We learned to live with it. We channeled our anger into action because weunderstand the assault that our free press has been under by this administration. The minute-by-minute deluge of outrages, the systematic tearing down of our Democratic institutions, attacks on our federal law enforcement agencies and our allies… it’s a dizzying news cycle to keep up with. We get it. That’s WHY we founded CitJourno.org. 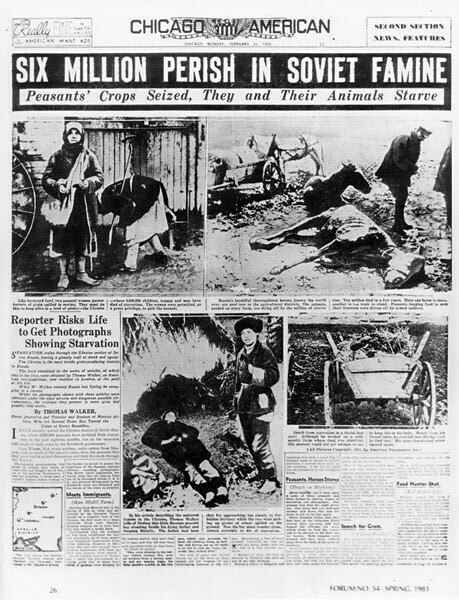 In 1932-1933, The New York Times published several stories denying The Holodomor, a famine that was intentionally inflicted by Joseph Stalin on the Ukranian people. By the time it was over, the Holodomor succeeded in killing upwards of 3.3 million Ukrainians by starvation. 3.3 million souls. Mothers. Fathers. Children. Families murdered by an intentional, state-sponsored famine. This was Joseph Stalin. This was what he chose to do to his own people. The famine was not unknown to the outside world. There were news outlets covering it at the time. We’ll get to some of them in a moment. But as for The NYTimes, the paper turned to their Moscow Bureau Chief, WALTER DURANTY, to cover the Holodomor. 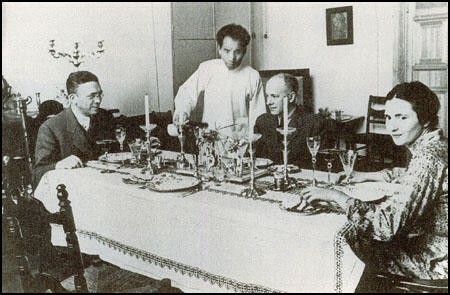 Walter Duranty at a dinner party in his Moscow apartment. In 1931, Walter Duranty won a Pulitzer Prize for his coverage of the Soviet Union. Duranty was considered the expert on Stalin. And although many also considered him a Stalin apologist, he was the man in Moscow who had access to Stalin’s administration. So, Duranty was the man The NYTimes counted on to cover the famine. And there is no doubt among all scholars, and now the NYTimes itself, that Duranty used his position to deny Stalin’s role in inflicting the Holodomor and the nature of the famine itself. Duranty is the “how” this black mark on The NYTimes happened. As for the “why,” it remains somewhat of a mystery. 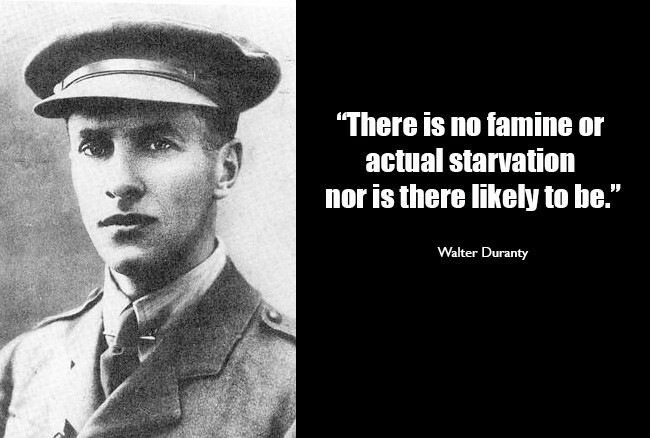 It wasn’t that Duranty was an ignorant dupe – or, in today’s terms, a “useful idiot.” Duranty KNEW there was a real famine; he admitted as much to a diplomat at the British embassy, William Strang, in 1932. So, why did Duranty fail to cover it with accuracy? The only conclusion we can draw is that Duranty was Stalin's apologist by choice. 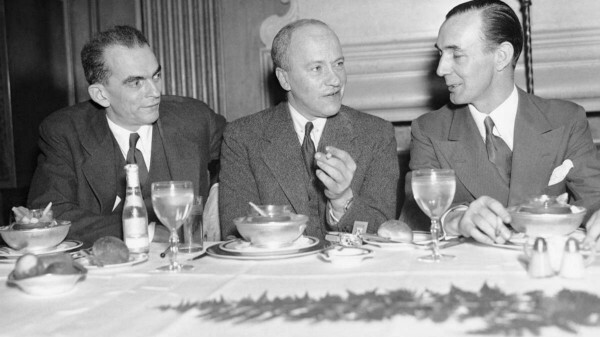 Duranty received fame, notoriety, and a prestigious position within The New York Times due to his access to Stalin, which included exclusive interviews. Perhaps, he was a Stalin-idealist, who agreed with the dictator’s political positions. Or perhaps, he was merely a sycophant, who fed off the continued favor afforded him by his proximity to power. Even at the time, The New York Times cannot claim that they did not know they were enabling a propagandist. For, they were warned from within. Some editors expressed concern about Duranty’s bias and the denials. They disagreed with Duranty’s work – with his “take.” Yet, despite their objections, The NYTimes continued to publish Duranty’s stories. There is a term now for Duranty’s particular brand of “reporting.” Unsurprisingly, it is pure Soviet in its roots: whataboutism. We’ve read Duranty’s articles on The Holodomor. And under this description, they are classic whataboutism. This is easy to see, especially when reading the coverage given by other US journalists and outlets, who weren’t engaged in Duranty’s immoral and self-serving methods. Two days later, on March 31, 1933, The New York Times published an article by Duranty titled, “Russians Hungry, But No Famine.” Its substance and intent is pure whataboutism. Give it a read. Then, there was a follow-up article by Duranty headlined, “Soviet Industry Shows Big Gains,” published April 6, 1933. Even the headline reads as a pro-Stalin PR response to a public relations crisis – designed to obscure. It was artful PR spin. Remember that term. The combination of Duranty’s tactics formed the basis of denial, and an apologist for mass murder went down in the history books. Given the NYTimes position as a highly respected paper of record, the world’s attention at the time was obfuscated, if not out-right diverted, from the cruelty unfolding in the Ukraine. The spin worked. Denial of the Holodomor continues to be pushed by Russian propaganda media to this day. It is part of the information war, as Russia instigates military violence in Ukraine. This was the consequence of an apologist masquerading as an investigative journalist – using PR spin to cover a murderous dictator’s crimes. Whatever the internal forces were that allowed Duranty’s stories to be published, The New York Times bears this historical accountability. They wear the scar of enabling an apologist. They were Stalin’s co-conspirators, and the Holodomor’s blood is on their hands for all eternity. Since the 2016 Presidential campaign, one very special NYTimes journalist has risen to fame and favor within their organization. Just like Duranty with Stalin, this rise is due primarily to her direct access to Donald Trump. We’ve gone through every article she authored during the 2015-2016 election season – both in content and timing of publication (equally significant), and we’ve come to the conclusion that this reporter is a full-blown, PR spin, Trump apologist. We feel ever more certain of this conclusion because, unlike Duranty, we think we know her motive – the “why.” It’s not a pretty picture. Despite all the articles published – and the incredible shooting star of journalistic fame being lavished on their reporter, The New York Times has failed to disclose to the public that she has family FINANCIAL ties to both Russia and the Trump-Kushner clan. This reporter is Maggie Haberman. We’ll break down Haberman’s PR spinning, apologist work in a minute. First, let’s give you some hard information that The NYTimes apparently doesn’t want you to know. Nancy Haberman, Maggie’s mother, works for the PR firm, Rubenstein, which was founded by Howard Rubenstein – a PR legend, who was once called “the dean of damage control” by Rudy Giuliani. At Rubenstein, Nancy Haberman is no coffee girl. Her bio lists her as Executive Vice President, and gives her history as "Rubenstein, Home with kids for six years, Harper and Row Publishers, New York Post." Later in her bio, it states, "Has a family of journalists. And the kids she was home with now have kids of their own." Nancy’s area of expertise: "Traditional media, i.e. print, radio, and broadcast. Big emphasis on New York media. General interest stories, medical, breaking news, nonprofits, education… Lends media support to other people’s clients with her relationships established over 30 years." Although Nancy claims she’s never “met” Donald Trump, she has admitted to doing PR for him (because, it would be impossible to deny). As for her PR firm’s history with Trump? Well, that’s a deeper dive. Howard Rubenstein’s work history with the Trump family began early with Fred Trump. Then in 1990, when Donald and Ivana were going through their divorce, Rubenstein took on Donald’s personal PR – doing the dirty work of spinning that nasty mess into something that wouldn’t tarnish Donald’s name and brand irreparably. Because that’s the real nature of PR, isn't it? The Brand. PR specialists, like Rubenstein and his EVP Nancy Haberman, work the media to the benefit of their clients. If there’s a damaging story about to drop, they’re the ones who get the call from the media outlet. They’re the ones who give a statement on behalf of their client. They’re the ones who SPIN. That’s their art. But it doesn’t end there. To be great at PR, one must also obfuscate. Set up counter-narratives in other outlets. Drop dirt on the opponent, if the story is a bad business deal or nasty divorce. Thwart the narrative in order to reshape it in the image that you’re trying to project. If you read what Howard has to say about his operations, you learn there are weekly staff meetings – where top executives (like Nancy) share everything going on with their clients and come up with strategies for the spin. It’s a group effort. PR is NOT journalism. It is whataboutism. At its core, PR is the work of apologists. And they have as much, if not more power to drop stories into MSM outlets than the journalists who are on the payroll. With the Rubenstein firm, the art and power of their business is unmatched. It also holds every secret of Donald and Fred Trump. We were all prepared to go out with this piece in early December, 2017. Then, we hit a proverbial oil well. In an old NYTimes article (ah, the irony) on one of Donald’s projects, the Wollman Ice Rink, we found Rubenstein’s name again. Here, he’s mentioned as repping Donald not for his divorce but for his business. This prompted a deeper look at Rubenstein’s work for Donald and the Trump “empire.” What we discovered is a history that reaches back to Fred Trump’s earliest projects, the NY mafia, and Sam Rubenstein – a crime reporter for the Herald, PR moonlighter for NY clients, and Howard’s father. We also learned about the oft-told fables of the entire Rubenstein family: including, how Howard got his start, and how his sons would later join the family business. We found links to the Lauders and ostensibly to Arthur Finkelstein - a GOP strategist, who apprenticed under Roy Cohn and worked with both Paul Manafort and Roger Stone. This dig definitely delivered - so much so that we are still sorting through it all. Rest assured, we will bring you everything that we find. But for now - for the purposes of understanding the powerful influence Howard Rubenstein’s firm has over the media and journalism, let’s focus on more recent events. Today, Howard no longer officially works for Donald. That baton – at least for Trump’s business brand, has been passed on to his son Richard’s PR firm. Howard and Donald do, however, maintain a 'mutually beneficial relationship'. When Howard was asked recently to comment on Trump, he certainly had nothing bad to say. PR gonna PR. Right, Nancy? But the Rubenstein firms’ ties and access to the Trump administration don’t stop with the Trumps. JARED KUSHNER is another high-profile Rubenstein client. And Jared’s relationship with Howard appears far more intimate. 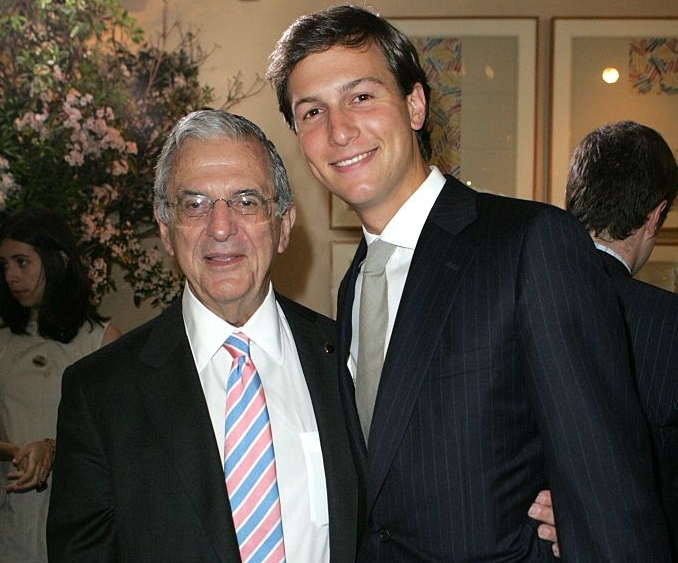 Jared is reportedly so close to Rubenstein, that it was Howard who Jared turned to when his father, Charles Kushner, was sent to federal prison (convicted in 2005 for illegal campaign donations, witness tampering, and tax evasion). That sounds like a close relationship, doesn’t it? Howard also played a pivotal role in another Kushner family milestone, when he advised Jared’s purchase of The Observer newspaper in 2006. A few months later, The Observer did a friendly puff piece titled ‘The Rubenstein Family’. But let’s move on to what this is really all about: The Money. How much in fees do you suppose Rubenstein’s firm made off of those two families: the Trumps and the Kushners? We bet it was a tidy sum. That money goes into many people’s pockets. It does things, like… pay for the EVP’s kids to go to private schools. It also comes with a certain privilege. Access. So, Maggie Haberman has a powerful parent, who’s connected to all the inside dirt on Donald Trump, his family, his business, Jared Kushner, Jared’s family, Jared’s business, and Nancy is paid to spin all this dirt into PR gold. We’d call that… access. But Maggie’s “job” is JOURNALISM, not PR. Journalistic objectivity requires detachment. It requires cold, hard facts. The kind of PR Maggie would have to do for real estate developers connected to the mafia, and/or sons who visit fathers in the federal penitentiary, is not the best look for the NYTimes – arguably the world’s most prestigious journalism brand. But it is the PR relationships that give Maggie her access. And if she doesn’t do the bidding of the spin masters – the bidding of their clients, she loses her access to them. Maggie would no longer be, as Vanity Fair described her, the “Trump Whisperer.” If she lost this “gift”, what would happen to her exclusive book deal? After all, the subject of the book is Donald Trump himself. We got it! Obfuscate the reasons for Maggie’s access to the President, then let her do her spin to get the exclusives. Keep. The. Access. This is the trade-off in which the NYTimes is well-versed. It is pure Duranty. So, since the NYTimes is not willing to reveal the family financial ties their star reporter has with the President and his family, how do they present Maggie Haberman? 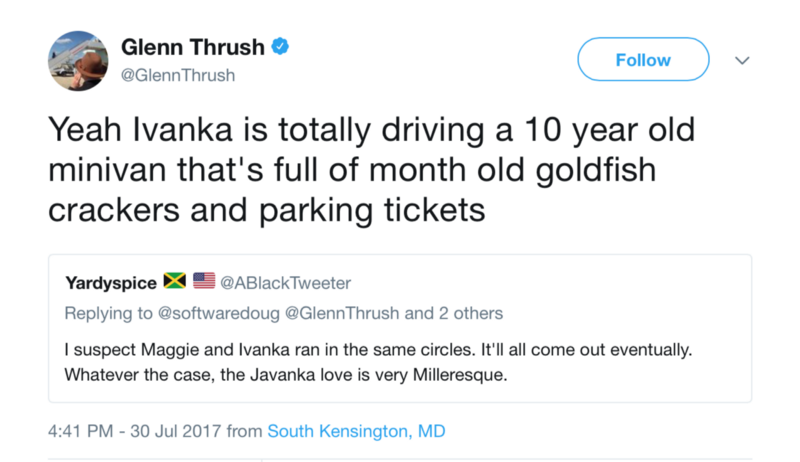 On July 30, 2017, Maggie’s fellow NY Times White House Correspondent, Glenn Thrush, tweeted a Politico article and mentioned his earlier tweets with Maggie about Jared Kushner and Ivanka Trump. No mention, of course, of Nancy’s employer Rubenstein and his close ties to the Trump-Kushner clan. And, no mention at all of the prestigious, upper west side, ultra-expensive private school Maggie attended. Or the elite college, where she got her degree. No. Maggie’s just a soccer mom with a van. Nothing to see here. Maybe if Glenn gets stuck in his harassment exile, he can go shill for a Rubenstein PR firm. He’s already got this doozy for his resume. In fact, it was such a doozy, that we went digging a little more. What we found was a Glenn-Maggie cooperation on Twitter in the form of another Duranty legacy tactic: GASLIGHTING. Gaslighting is psychological manipulation through the spin of information. The goal is to make victims question or doubt their perceptions of reality. It is a strategic assault on facts. Duranty’s denial of the Holodomor famine was a form of gaslighting the public about the facts of Stalin’s involvement. Apparently, the facts of both Maggie’s and the Rubensteins’ connections and history with our President and his businesses warranted a full-on gaslighting assault. She then proceeds to list Rubenstein’s connections to Murdoch, the Kushners, the Trumps, and Murdoch’s New York Post – where, notably, both she and her mother once worked. This tweet storm was initiated as a response to a far-right blog’s, Big League Politics, story that H.R. McMaster’s deputy’s husband worked for Nancy Haberman at Rubenstein (August, 2017). It insinuated that McMaster was leaking to the press via this connection. Tone is everything with this type of artful, PR spin. Maggie knows her mom’s craft well. On her mother’s connections alone, Haberman has an “in” with the President and his family of which her colleagues cannot compete. Just like Jared and Ivanka, Maggie is a beneficiary of nepotism. And it has thrust her right to the front page. But there’s more than just Nancy. Maggie’s access-spinning-nepotism-conflicts include her Father-In-Law, Vartan Gregorian - President of the Carnegie Corporation of New York. The Carnegie Corporation is the main funder of the Carnegie Endowment for International Peace, of which Carnegie Moscow Center is a regional affiliate. Though once critical of autocracy, the Carnegie Moscow Center, a think tank, now spouts the Putin party line. This is especially important as it concerns the Congressional bill related to sanctions on Russia, the Magnitsky Act, which is thoroughly despised by Vladimir Putin himself. In an op-ed posted on Carnegie’s website, the latest round of sanctions are described as causing conflict between the US and Russia, as well as the US and the rest of Europe. Alexander Baunov, the author of the Carnegie piece, believes the latest round of US sanctions resemble “a second round of punishment for the same alleged crime.” He goes on to say, “Moscow suspects that it is being punished both for actions long in the past and for an election result which it influenced only indirectly.” Whether you agree or disagree, these statements have a decidedly pro-Kremlin slant to them. There is no doubt that Russia interfered in the US election directly, as the American intelligence community has made clear repeatedly. Outside of Russia itself, there are few people who believe otherwise. One of them is Donald Trump, who has yet to say a bad word about Vladimir Putin. What drives Carnegie’s pro-Kremlin line? Is it money, or is it truly a shared ideology? Like with Duranty, it’s difficult to know for sure. Regardless, Carnegie’s relationship with the Kremlin is a problem the same way Nancy’s company’s relationship with Trump and Kushner is a problem. These conflicts are much too close to home for Maggie Haberman to maintain any semblance of journalistic objectivity. And they offer an explanation on her obsequious coverage of the Trump and Kushner families both throughout the election and the Trump presidency. It's unmistakable to us that Maggie is just running PR on behalf of her mother's clients and her father-in-law's interests. As we have stated several times in this piece, PR is not journalism. A PR professional’s job is to spin a story to portray their client in the best light possible. And where scandal or crimes are involved, that spin is in the form of apologistic obfuscation. Maggie’s coverage of the Trump and Kushner families is Duranty-level apologist spin. As long as the NYTimes values a reporter's access over their integrity, this will continue. And atrocities are sure to follow. Consider what is still unfolding in Puerto Rico. Deaths there can be directly linked to the administration’s failure to respond with America’s full might, coordination, and resources. Normalizing the Trump presidency is not the route our Democracy requires of the Fourth Estate. What if the next disaster is even worse? The New York Times’ refusal to acknowledge these potential conflicts of interest is staggeringly unprofessional, at best. It verges on journalistic malpractice. The New York Times must correct this mistake immediately. We the People demand better. We like ending with a request for action. We like having as many citizen diggers as possible involved in the stories we break. That’s part of shoring up the Fourth Estate. We want every one of you involved in getting to the facts. This is the request: Dig on all of Maggie Haberman’s articles and tie them to the other news that was breaking at the time. We’re looking for an intentional pattern to obscure real news in favor of spinning Donald Trump garbage into gold. We’re looking for obfuscation. Think of the example we gave with Duranty and the famine. When the news broke on other outlets, Duranty began his spin – the whataboutism, which helped obscure an atrocity. And as for you, @NYTimes? You have a chance now to right this ship. Perhaps some of you forgot about Duranty and your legacy with him. But when 3.3 million people die, history is not that easily re-written. History doesn’t forget. Truth remains truth. Fact remains fact, even in the Trump era. Don’t miss the weight of this moment. We’re looking at you, A.G. Sulzberger. Sure, you got the job as publisher thanks to your paternal line. It doesn’t matter how much you may believe you've earned it, no one will ever see it otherwise. But, you can make your mark. You can prove that you have what Maggie, Jared, and Donald don’t: the ability to lead beyond nepotism. You can return The Gray Lady to her rightful place as a paper of record and beacon of journalistic objectivity. Gut your house. Clean it. Get rid of the apologist sycophants. Elevate the investigative journalists who have earned their positions. There are many great journalists out there who would jump at the chance to work for you. Find them. Vet them. Let them flourish. To report accurately on our nation’s current situation, you must understand what got us here. Dig in your archives to find the truth about Trump’s Mafia ties. We already did - and we found a lot. Have your investigative journalists who have integrity dig deeper into Trump’s corrupt history. Publish their stories on your front page. Stop setting up convenient sit-downs with people of power through their PR reps. And if you must do this, don’t print a story where a single hard question isn’t asked. Because we may be little now, but we’re not stopping here. We will continue to multiply via social media. We will continue bringing daylight to your star apologist and any of her cohorts. And we’re digging in to that relationship you have with Rubenstein PR, plus a whole lot more on the Haberman apologists (next page for the teaser). We the people aren't going away. If you’ve made it this far, hopefully we grabbed your attention enough to want to know more. Never fear, this story does not and cannot stand alone. This brand of PR journalism has been around longer than you might expect, and Maggie Haberman might not even be the first person in her family to practice it. We mentioned Maggie’s father, Clyde Haberman, wrote about Donald Trump sporadically in the 1980s and ‘90s earlier in this piece. It’s an interesting factoid, but an inconclusive one on its own. After all, lots of people wrote about Trump over the years. You may have noticed that Donald Trump and Israeli Prime Minister Benjamin "Bibi" Netanyahu are close allies and friends. On the surface, it seems to entirely stem from the Kushner family’s relationship with Netanyahu himself. How close? Well, Bibi once spent the night at the Kushner home and even kicked Jared out of his own bedroom in the process. Jared’s dad, Charles Kushner, also paid Bibi hundreds of thousands of dollars for speaking engagements over the years. But what if there’s still more? To get to the heart of the matter, you need to know this about Maggie’s dad, Clyde Haberman. He was the New York Times Jerusalem Correspondent from 1991-95. During those years, Clyde Haberman was an essential link between the American public and Israeli politics. Battered at the polls and riddled with dissension, Israel's once-dominant Likud Party began today to try rebuilding itself by openly embracing American-style electoral changes. In the process, the most "American" of prominent Israeli politicians emerged as the clear front-runner to become Likud's next leader: Benjamin Netanyahu, a 43-year-old former delegate to the United Nations who is solidly backed by American contributors and who beats all rivals in using television to maximum advantage. Unsurprisingly, Mr. Haberman covered Netanyahu extensively over the next few years. But what’s the relevance here to Clyde’s daughter, Maggie Haberman, and her coverage of Donald Trump? It starts with Donald Trump’s nearly lifelong friend, billionaire Ronald Lauder, and their mutual ally Bibi Netanyahu. Their relationship leads straight to this image below. Stay tuned. Part 2 is coming soon.